A Scrap at a Time: Dr. Seuss!!! 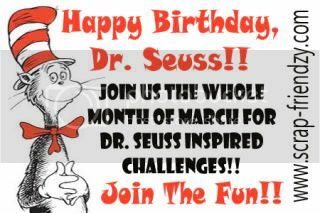 I hope you all will come join us this month at Scrap Friendzy as we celebrate a month of Dr. Seuss. All month long we will have challenges based off of some of our favorite books. My first challenge went up today based off of Austin's favortie book Green Eggs and Ham. Come check us out to find out all the details. Here is the LO I created for my challenge. Love your star Tracy! Great page!